Great for live or recording. The latest development in Mackie's small format mixers, the ProFX series v2 sounds better than ever and supplies convenient features at every knob, fader, input and putput. This is the ProFX30v2. It features 24 extremely low-noise Mackie Vita mic preamps designed to add life to any input, as well as the all-new ReadyFX effects engine with 24 great-sounding effects including reverbs, delays and choruses. Single-knob channel compression for smooth, even dynamic control (ch. 11-14). A 7-band graphic EQ is available on the master output, switchable for tuning mains or monitors, and an aux output is perfect for driving a monitor mix. A USB output/input can record your show or supply recorded music to the system. There is a 3-band EQ (80Hz, 2.5kHz and 12kHz) on all three input channels. The midrange is sweepable. Each channel features individual channel mutes and an overload indicator. The input scheme features 24 XLR inputs with TRS option, as well as dual 1/4" stereo input channels. A built-in USB interface allows recorded music to be played between sets, and you can even use it to bus your mix to a recording device. 60mm faders, four flexible subgroups. You can directly connect guitar, bass and other instruments via Hi-Z input or connect a microphone and take advantage of the Vita preamp. It features a 100Hz low-cut filter and 48V phantom power on all mic channels, along with a stereo RCA tape I/O with input level control. A headphone output with separate level control gives your engineer a second point of reference. The ProFX30v2 also has Balanced XLR and balanced/unbalance ¼-inch main outputs, an FX mute with remote control via footswitch, and a break switch that mutes all channels for music playback between sets. Mackie 's legendary œBuilt-Like-A-Tank design is reflected in the solid steel chassis, tough ABS side protection, and quality posts and knobs combine to protect your investment. Rugged and roadworthy are two of the most common adsjectives used to describe Mackie equipment. With mixers, that is a critical attribute. For international traveling, the ProFX30v2 includes a robust internal multi-voltage power supply. 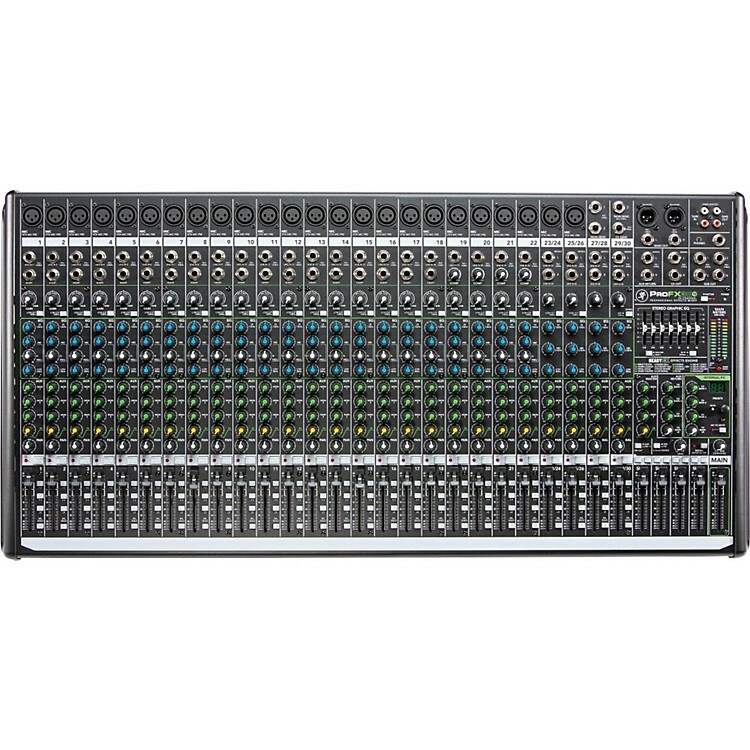 Order today, and introduce your stage or studio to Mackie sound and reliability.